Ringworm infection in dogs is a serious health issue. Always contact your veterinarian if you see hair loss or lesions for proper diagnosis and treatment. The medical term for the parasitic fungal infection that affects the hair, skin, and/or claws/nails is called Dermatophytosis. There are three common forms of Dermatophytosis - Trichophyton mentagrophytes, Microsporum gypseum and Microsporum Canis (most often called ringworm). These diseases can occur in dogs, cats and other warm blooded animals. It occurs more common in younger animals and less often in older. Although it is called ringworm, it is not a parasitic worm at all. It is caused by fungus and is a highly contagious infection. This can lead to hair loss on dogs and can spread to other pets in the home and people too. The common name “Ringworm” is given to a fungal infection of the epidermis (outer non-vascular layer of skin), nails and hair. This infection can occur in humans and all domestic animals. Ringworm gets its name from the appearance of a round red raised “ring”, making the boundary of inflamed lesions on humans infected by the fungus. There are several distinct forms of dermatophytes. Although some of the strains are species specific, they will only infect one species of mammal, other are zoonotic, meaning they will spread between species and to humans as well. Keratin is the food that fuels ringworm being found on the outer layers of skin, hair and nails. Commonly the fungi infect hair follicles, causing the affected hair to weaken and break at the base of the skin. Often this will result in patches of hair loss in a circular area or ring. As the fungus grows and spreads, it will begin to cause irregularly shaped losses of hair over the infected dog. How Does My Dog Catch Ringworm? Transmission happens through direct contact with an infected human or other animal. It may be passed from cats to dogs to humans and vice versa. The spores of the fungus may live in the environment for a long time frame, up to 18 months. This includes carpets, furniture, toys, grooming tools, carpets, bedding, etc. The fungus has an incubation period of at least 10-12 days. If you or your dog is exposed, it will take 10-12 days for any symptoms to appear. In some rare cases, dermatophytes has been found to live in soil. It may live for months if the nutrients in the soil are right. Which Dogs Are More Prone to Ringworm Infection? Puppies of less than a year get ringworms in most cases. Although dogs with immunocompromised systems, stressed or malnourished dogs are also at higher risk. Healthy animals are at the lowest risk. What Are the Symptoms of Ringworm in Dogs? 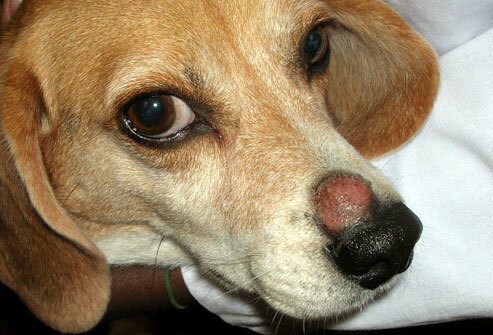 In the canine, lesions from ringworm often appear as hair loss (alopecia) and they are often roughly circular. When the lesions enlarge, the original infection areas will heal from the center out. Sometimes you will note hair regrowth in the middle of these lesions, although the affected hair shaft is fragile and breaks easily. Often the infected areas are not itchy, although they may become inflamed and develop a scab. Most of the time there will be several patches of hair loss on the body of the dog. On some occasions, a fungal infection of the nails (onychomycosis) will occur. This will make the claws to become brittle rough and broken. There are occasions were a dog has the ringworm fungi without symptoms. These dogs are still able to spread the fungi to others even though there are no clinical symptoms. They are called “asymptomatic carriers”. These carriers are most problematic in kennels, shelters or areas where there are multiple animals living. Due to the potential of this fungal infection spreading over the dogs body and its inherent risk of spreading to people and animals, it is imperative that you see your vet if you notice any signs of skin problems. Your veterinarian has several ways to test of ringworm. He/she may use a Wood's lamp (Ultraviolet light) to examine your dog’s coat. He may take a hair sample to analyze under a microscope or your vet may take a sample of the infected area for lab testing. As with all infections, treatment depends upon severity. Your veterinarian may prescribe miconazole shampoos or ointments. They may even recommend a lime sulfur dip to kill the fungus. Or the option of oral medication may be the best rout. If it is a server case, your veterinarian may have to clip away fur in the affected area as well as using oral and ointment treatments. Once treatment(s) have begun, you will see healing in one to three weeks. As with all treatments it is very important to follow through on the recommended treatments for the time prescribed by your veterinarian. Even if the lesions are cleared up, it may require follow up testing to ensure the dog is cured, even though the dog may be cured from ringworm re-infection can happen. Pets infected will remain contagious for approximately three weeks using an aggressive treatment. If minimal treatments are used, ringworm will remain contagious for an extended period of time. This also applies if you are not diligent in following your veterinarian's treatment recommendations also. It is recommended that you minimize your family members and other pets to exposure during this time period. What About Risk to Humans? Ringworm is very contagious to humans as well, especially young children; it is very important to take all appropriate steps to minimize exposure while the dog is being treated. If your pet has been diagnosed by your veterinarian with ringworm, he or she will instruct you on what you must do to prevent it from spreading. This is very important to prevent other pets or even humans from contracting the fungus. It is imperative that you follow your veterinarian's directions, as the fungus is very hardy and difficult to eliminate. You may be required to bathe all of your pets with medicated shampoo. You may be required to wash and disinfect or even discard the infected pets bedding, grooming equipment and toys. Also frequent vacuuming will help as the fungus can survive on hair and skin shed by your pet. Remember to change your vacuum bag to help prevent transmission. It is a good idea to wash your hands thoroughly after touching or bathing your dog. Your good personal hygiene will help prevent the disease from spreading.